Richard: There are two kinds of people in this world, winners and losers. Alternate Ending # 1 had the family stop at a rest stop the next day as they're driving back home. Richard talks fondly about Grandpa, and then the family toasts to his memory. You actually can't hear the dialogue, since the only audio option is for the director's commentary on this ending. Basically, the filmmakers thought that it was too sappy (since it was too sunny during the scene) and so they stopped filming. Alternate Ending #2 had the family handcuffed at the security office at the hotel. The security guard tells them that Olive is disqualified from the competition and that they are released, under the condition that they are banned from entering beauty pageants in California again. He releases the family members, and they start to walk out of the lobby. Sheryl places a crown on Richard's head, who in turn places it on Olive's head. As they exit the hotel, Richard asks "who wants ice cream?" Alternate Ending #3 had Olive running out into the lobby of the hotel, acting as a lookout, as you can hear everyone else arguing off-screen about stealing the trophy. She signals that the coast is clear, and so the others run out of the hotel carrying the trophy (while Frank wears the crown). Alternate Ending #4 is the same as #3, but it's extended. Title cards detail the family stealing the trophy from the room, running down the hall, running out of the hotel, running into the van, and driving off. Q: What did Dwayne's T-shirt read? 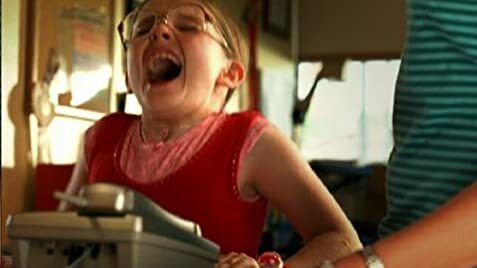 Q: Is "Little Miss Sunshine" based on a book? Q: Who is Marcel Proust? 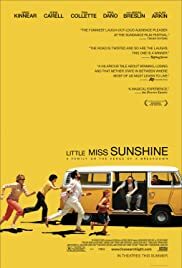 Keeping up with the recent buzz-worthy films coming out of Sundance the past couple years, Little Miss Sunshine is a gem of a movie. After loving crowd favorites Primer (2004) and Hustle and Flow (2005), I wasn't quite sure if the hat trick would be made. Sunshine seemed to have the cast, and direction (the debut of husband/wife team Valerie Faris and Jonathan Dayton, who have helmed some of my favorite music videos including the Smashing Pumpkins' Tonight, Tonight and the Red Hot Chili Peppers' Otherside), but the big question would be if it had the laughs to sustain the quirky indie comedy from not being overwrought and boring. While the film definitely has a couple moments where I was about to be lost, everything ends up happening for a reason; emotions are on a roller coaster ride and the lows always come out with meaning and momentum for the highs. Do yourself a favor and see this sweet, subtle at times and gut-bustingly hilarious at others, perfectly pitched ensemble piece. The co-directors set us up for what is to come in a very nicely designed opening sequence by going character to character, showing us each person in a small vignette of their personalities. This is the quintessential messed-up family with good intentions. Mom and Dad are bickering on how to tell their young daughter about her uncle's attempted suicide, while he sits and stares in a strange melancholy next to the mute, troubled son, (on vow of silence in honor of nihilistic mind Nietzsche), while grandpa spews profanities about the lack of dinner variety. I mean this is the epitome of every family function I've ever been privy to. There is so much a viewer can relate to in each member, allowing for a certain amount of compassion for the views of all involved and seeing that each really does want the best for one another, even if they have a messed up way of showing it. Greg Kinnear and Toni Collette are wonderful as the patriarchs, proving as always that they are probably two of the most under-appreciated actors working today. Very rarely do you get to see them in a starring vehicle, and even though this is an ensemble through and through, they definitely carry it as the driving force. Alan Arkin does his kooky, quasi-angry, sarcastic yelling that he is known for, kind of his role from Edward Scissorhands but r-rated and un- pc. Everything he has done comes to a surprising result at the eponymous beauty pageant for the biggest laughs of the movie, really great stuff subverting the grotesque surrealism surrounding any pageant of this kind. Paul Dano is great as the troubled teen, trying to find a place in the world for himself, and coming to grips with the need for struggle in order to grow as a person, and Abigail Breslin is phenomenal as the happiest girl alive. Once she finds out she has won her regional on default, (those primary school children and their diet pills), she is on cloud nine as the family makes the road trip all for her. She has the acting range of a pro and actually does the Dakota Fanning, but better, as she can act while still being a young child and not an adult in a child's body. Her emotional reactions are spot-on and she has remarkable presence and a self-effacing nature that allows her to be who she is and not be ashamed about it, which is the main purpose of Olive Hoover. The real revelation to take from the antics on screen is a career-role for funnyman Steve Carrell. I've always liked his naïve, teddy-bear persona used to successfully in the Daily Show, The Office, and as the only funny part of Anchorman. Here however, he shows that he has the acting chops to not be pigeonholed and typecast in the over-the-top, lug roles his peer Will Ferrell will never be able to breakout of. Carrell has genuine talent and his suicidal, top Proust scholar in America, uncle is the shining moment of the film. He maintains the dejected quality throughout; even when doing something for the family, doing good, he is always a beaten man. That kind of character is what is needed for all his sharp, dry sarcastic retorts thrown about. He barely outshines the prop of the year, though, the family's yellow VW van. You will not see better prop-gags as the van takes a licking and keeps on ticking although the tick is faint and slowly fading away. Little Miss Sunshine lives up to the strong buzz that surrounds it. It is heartwarming and funny at every turn. There are some dark moments, though, as there are in life. This film is a slice of reality, heightened just the right amount, for all to enjoy. While definitely in the vein of films such as I Heart Huckabees, Thumbsucker, and any Wes Anderson filmit wears its indie cred on its sleeveit is still accessible and hopefully with the drawing power of Carrell will garner an audience that would not otherwise see it. 171 of 264 people found this review helpful. Was this review helpful to you?